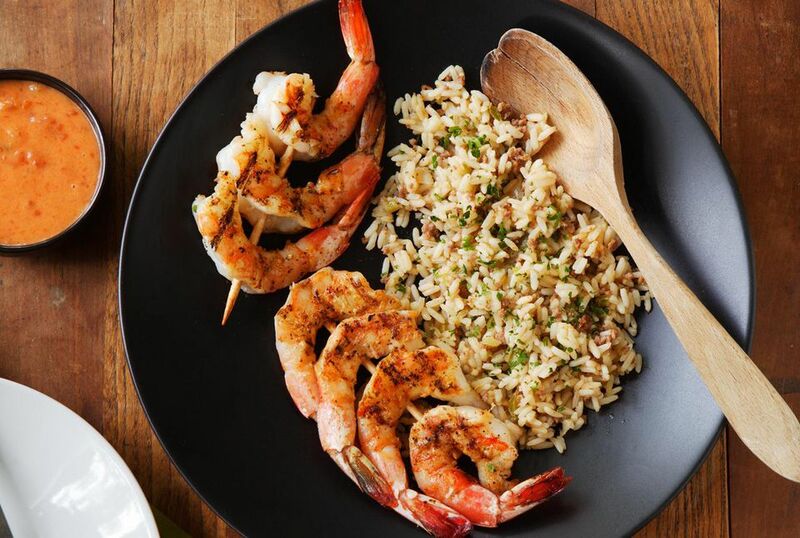 Lemon and garlic grilled shrimp makes a fabulous meal with a rice dish and a simple salad. Thread the shrimp on skewers or grill them in a grilling basket. The simple marinade of lemon and garlic flavors these shrimp perfectly. Serve with rice and a salad for an effortless meal. In a nonreactive bowl or plastic food storage bag, combine the oil, lemon juice, sliced green onions, parsley, garlic, basil, mustard, and salt. Blend thoroughly. Add the cleaned shrimp to the bowl or bag. Cover the bowl or seal the bag and refrigerate for about 1 hour. Grill the shrimp over hot coals for about 5 to 7 minutes, turning halfway through the cooking time. The shrimp will be opaque and pink when done. The shells are usually easy to remove by hand. Just pull off the legs, pull the shells apart from the bottom, and slip them off. You may also use shears to cut the shells off. Depending on the recipe, you might want to remove the tail. The tail makes a nice "handle" if you're serving them as an appetizer or grilled. The vein is the shrimp's digestive tract. It isn't harmful, but it's unattractive and might be gritty. To remove it, cut a shallow slit down the back of the shrimp. Using the tip of the knife, coax the vein out. You should be able to pull it right out. If not, scrape it out with the tip of the knife. Rinse the cleaned shrimp under cold water. Discard the shells or use them to make stock. If you don't have enough to bother with, freeze them in a freezer bag and add more whenever you have shrimp.